So far, Trump has not exhibited any of these traits. Nevertheless, he will soon make consequential decisions affecting the future of the successful 2015 Iran nuclear deal, the course of the North Korean nuclear crisis, and the potential for renewed strategic nuclear competition with Russia. Unfortunately, his appointment of the bellicose John Bolton to serve as national security adviser (Trump’s third in 16 months), along with hawkish CIA Director Mike Pompeo as secretary of state, could tilt the malleable president in the wrong direction. The result could be three full-blown nuclear crises. North Korea negotiations. Trump’s appointment of Bolton is odd in that Bolton’s policy prescriptions on North Korea run counter to Trump’s stated policy and that of ally South Korea of using sanctions pressure and diplomatic engagement, including a summit with Kim Jong Un, to halt and reverse North Korea's nuclear and missile programs. After the atrocities in Syria, what is the future for the treaty banning chemical weapons? The August 2013 sarin nerve agent attack on Ghouta, which killed hundreds of Syrian civilians, led to a Russian-U.S. agreement on eliminating the Syrian government’s chemical weapons and Syria’s accession to the 1993 Chemical Weapons Convention (CWC), which bans production, possession, and use of chemical weapons. The Organisation for the Prohibition of Chemical Weapons (OPCW) and the UN Security Council established the multilateral machinery to monitor the implementation of these decisions. However, a number of states, mainly Western ones, continue to question the completeness of Syria’s chemical weapons declaration; and the use of chemical weapons—chlorine, sulfur mustard, and sarin—did not end. Although the international community has remained united in its condemnation of such attacks, views about the extent of Syrian governmental responsibility fuel debates within international bodies and have become increasingly fraught and reminiscent of Cold War rhetoric. Reported chemical weapons use has continued into 2018, even after the military defeat of the Islamic State group and after the Syrian government had re-established at least nominal control over most of its territory. It is against this backdrop that the fourth CWC review conference is scheduled to meet November 21-30. It is important to find ways to manage the Syrian chemical weapons issue so as to avoid lasting damage to the CWC regime and its institutions. Further, it is vital to protect the independence of the international mechanisms for investigating alleged CWC violations while holding accountable those responsible for chemical weapons use. Allegations about chemical weapons use in Syria started in 2012. In March 2013, the UN secretary-general used his authority to investigate a case presented to him by Syria alleging chemical weapons use by opposition groups the prior month. France, the United Kingdom, and later the United States impressed on the secretary-general the view that allegations of such use by the Syrian government should also be investigated. This resulted in extended consultations among governments and UN officials on which cases the United Nations should investigate. This incident, which drew the threat of U.S. military action against the Syrian government, triggered a series of unprecedented steps. The accession of Syria to the CWC in September 2013, which was synchronized with the agreement of the Russian-U.S. framework on the elimination of Syrian chemical weapons along with subsequent decisions by the OPCW and the UN Security Council to implement this framework. The work of the OPCW-UN Joint Mission in Syria to verify the destruction of Syria’s chemical weapons program, including the shipment of chemical warfare agents and precursor chemicals for out-of-country destruction (October 2013-September 2014). The establishment of the OPCW declaration assessment team to clarify and resolve inconsistencies and gaps in the Syrian declaration (spring 2014). The establishment of the OPCW fact-finding mission (FFM) to investigate the continued allegations of chemical weapons use in Syria (spring 2014). The decision by the Security Council to set up the OPCW-UN Joint Investigative Mechanism (JIM) to establish who was responsible for the confirmed chemical weapons use on the basis of work carried out by the fact-finding mission (2015-2017). The JIM mandate expired in November 2017 as a consequence of deep divisions in the UN Security Council, in particular Russian criticism. The work of the other mechanisms continues, but in the absence of a handover of confirmed cases from the fact-finding mission to the JIM, the question of responsibility for these transgressions is now largely relegated to national assessments. Nevertheless, efforts are underway at the Security Council to replace the JIM with a new investigative mechanism: a UN Independent Mechanism of Investigation. The Security Council considered a draft Russian proposal in January, while the United States has tabled a revised proposal, which was considered in early March. The Russian delegation did not attend the March meeting.2 Meanwhile, France has launched an International Partnership Against Impunity for the Use of Chemical Weapons. Incoming OPCW Director-General Fernando Arias of Spain will assume his duties on July 25. This change at the helm of the secretariat, as well as the upcoming CWC review conference, presents challenges and opportunities for returning to common strategies for handling and perhaps resolving the Syria chemical weapons problem. The situation in Syria involves several interconnected elements: the completion of the destruction of the declared aspects of the Syrian chemical weapons program; the completeness and accuracy of Syria’s declaration of its chemical weapons stockpile and production capabilities, including whether undeclared stockpiles remain in Syria; the continued use of chemical weapons against combatants and civilians; and the question of responsibility for such incidents. The work of the fact-finding mission also continues. In January, a team visited Damascus and transported biomedical and environmental samples back to the OPCW laboratory.6 Although the team’s mandate includes the investigation of whether chemical weapons have been used in Syria, it does not extend to establishing responsibility for their use. UN Security Council Resolution 2235 established the JIM on August 7, 2015, with a mandate to identify those responsible for confirmed instances of suspected chemical weapons use. 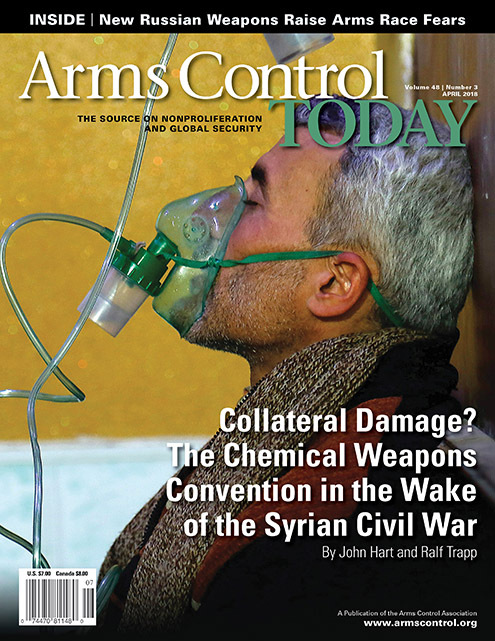 Attributions of responsibility are summarized in the third, fourth, and seventh JIM reports.7 In 2016 the JIM concluded that nonstate actors were responsible for one chemical weapons incident, and it attributed three cases to the Syrian government from the initial nine cases it investigated that year. In 2017 the JIM found that nonstate actors were responsible for sulfur mustard use at Umm Hawsh on September 16, 2016, while the Syrian government was responsible for the sarin attack on April 4, 2017, at Khan Sheikhoun. The JIM collected samples from Syrian officials and opposition groups, as well as via third parties in Turkey. It also had access to the analytical results of samples collected by the fact-finding mission from autopsies carried out in Turkey. On July 6, 2017, the head of the JIM, Edmond Mulet of Guatemala, briefed the UN Security Council. After the meeting, he stated to the media, “We do receive, unfortunately, direct and indirect messages all the time from many sides telling us how to do our work.”8 Four months later, Bolivia and Russia voted against a U.S. proposal that supported the JIM findings and that would have extended the group’s mandate by 12 months. Russia proposed that the mandate be renewed for six months on the condition that the group’s attribution of responsibility findings were not final. Japan proposed a compromise 30-day extension. Bolivia and Russia did not accept Japan’s proposal. Essentially only the Western Europe and Other Group states, in their plenary statements, sought to hold the Syrian government responsible. China, India, Jordan, Pakistan, the Africa Group, and the Latin America and Caribbean Group more generally refrained from taking a public position. Compliance in arms control is a state-centered concept. With regard to Syria, the JIM, the fact-finding mission, and the declaration assistance team have articulated findings that either confirm or imply Syrian noncompliance with prohibitions and obligations undertaken under the CWC and with decisions adopted by the OPCW and the UN Security Council. In situations of confirmed noncompliance, the goal of CWC treaty mechanisms is to restore compliance as quickly as possible and to create conditions that will enable and motivate the noncompliant state to take remedial actions. Measures to this end can range from political to treaty-based measures and may extend to referral of the matter to the UN General Assembly and Security Council. Otherwise, the UN Security Council may authorize the use of military force under Chapter VII of the UN Charter or impose international sanctions. The OPCW Sub-Working Group on Non-State Actors has considered the question of accountability in some detail, including by strengthening CWC implementation legislation, encouraging stronger law enforcement, promoting measures to ensure legal cooperation between states-parties, and engaging in capacity-building work to assist states with chemical weapons attacks prevention, protection, response, and recovery. On January 23, France launched an international partnership against impunity for the use of chemical weapons.13 Participants of the initiative, consistent with international law and respective national laws, regulations, and policies, undertake a variety of efforts to “hold accountable those responsible for the proliferation or use of chemical weapons.”14 France will act as the coordinator in 2018 and will present the initiative at the EU Working Party on Non-Proliferation and at a NATO meeting. A major objective will be to expand participation by CWC states-parties. At the launch, then-U.S. Secretary of State Rex Tillerson criticized Russia for having not fulfilled its role as a guarantor of Syria’s implementation of its CWC obligations. He emphasized that “this initiative puts those who ordered and carried out chemical weapons attack on notice. You will face a day of reckoning for your crimes against humanity and your victims will see justice done.”15 Russia criticized the initiative as a “restricted format meeting” from which it was excluded and which “attempts to replace the OPCW and to create an anti-Damascus bloc through the proliferation of lies.”16 Unsurprisingly, attempts to agree and impose restorative measures have not worked. The upcoming review conference cannot ignore continuing chemical weapons use in Syria. Disagreements about attribution, culpability, and punitive measures, however, may derail the conference and further deepen the political divisions in the organization. It is therefore useful to review options that the OPCW has to manage this problem. Consensus also should be achievable on a clear and unequivocal condemnation of any use of a chemical weapon by any state or nonstate actor under any circumstances. A similar condemnation should be achievable with regard to any direct or indirect assistance, inducement, or support for such acts by whatever means, i.e., any form of support for the acquisition and use of chemical weapons, such as financial support and the provision of materials, equipment, and know-how. There also seems to be space for consensus on the need to continue the work of the declaration assistance team and the fact-finding mission. Attribution of culpability for past and future acts of chemical warfare in Syria could be pursued through processes outside the OPCW and the UN Security Council, including through the efforts by individual countries or groups of states; by mechanisms under the UN General Assembly (e.g., the International, Impartial and Independent Mechanism to Assist in the Investigation and Prosecution of Persons Responsible for the Most Serious Crimes Under International Law Committed in the Syrian Arab Republic Since March 2011); or by multilateral entities such as the Independent International Commission of Inquiry of the Human Rights Council. Efforts could continue in parallel to enhance the forensic capabilities of the OPCW to agree on common standards and criteria that would further clarify the technical basis for attribution of responsibility. The OPCW has considered forensic investigations of alleged chemical weapons use in the past, and the OPCW Scientific Advisory Board issued its first report on these issues in 2016.19 This report emphasized the desirability to collect and curate reference standards and analytical information even if not immediately actionable and highlighted the utility of impurity profiling and isotopic ratio distribution measurements for attribution purposes. These findings link the sarin formulation found after two chemical weapons attacks in Syria to that declared by Syria in its initial stockpile declarations. Russia, however, challenged these findings, as well as recent reports about the use of chlorine gas in East Ghouta. U.S. and other officials have attributed this chlorine use to the Syrian government.22 Even the further development of chemical forensics methods in the field may become controversial, and scientific findings may become challenged in the absence of agreed common standards used in such forensic investigations.23 In short, governments can view the scientific principles and standards through a prism of their geopolitical implications as they pertain to Syria in particular and the Middle East more broadly. A firewall approach may prevent the current polarization and politicization from damaging CWC norms and the longer-term integrity of the OPCW. Nevertheless, this may be seen as a de facto legitimization of what some states-parties see as continuing noncompliance with one of the core prohibitions of the CWC. This approach also might undermine the technical consensus about acceptable scientific criteria for evaluating investigation findings. This approach would likely compel more governments to clearly articulate their positions and assessments, but there is no guarantee about the vote’s outcome given the increasingly partisan OPCW atmosphere. A sizable percentage of the executive council and the conference could still decide to abstain and not take a public position.25 Voting on this matter also would deepen the divisions within the organization with little short- to medium-term prospects for returning to a common approach based on the principle of equal rights and responsibilities among all member states. In short, such a move could result in recriminations, a dysfunctional treaty regime, and paralyzed institutional and investigative mechanisms. Other international mechanisms, as well as states individually or through collective mechanisms such as the France-led partnership, would continue to gather and preserve evidence for future judicial proceedings. Such proceedings would require the creation of a special tribunal or the activation of the International Criminal Court, which in the case of Syria would require a referral by the UN Security Council. Allow the issue to recede quietly. A third option would be to place the issue on the back burner until the geopolitical situation in Syria has stabilized and the geopolitical conditions for future arms control verification steps have become clearer. Such an approach might facilitate cooperation among states-parties in other CWC implementation areas and contribute to what could be presented as a “success” of the review conference, albeit without a clear condemnation of chemical weapons use by Syria. Measures to mitigate the associated risks could include an informal-track process of consultations to limit damage to the CWC regime and its institutions. An informal review of compliance assessment methodologies in general and as applied in the case of Syria could be carried out. Efforts could be made to enhance OPCW forensic capabilities and to develop a scientifically and technically trusted system of investigations with commonly accepted criteria and standards. The OPCW could continue considering how its competencies and capacities can most effectively deal with nonstate actor threats. A weakened norm against the use of such weapons would likely be the price for a return to cooperation and unity among CWC parties under such circumstances. Whether this option is politically palatable or wise must be questioned. There are no easy options for the OPCW to bring closure to the Syria issue. The primary objective must be to prevent any future uses of chemical weapons in the Syrian and the broader regional armed conflict. The use of such weapons is not the only violation of humanitarian law, and resolution of the Syrian chemical weapons challenge is intrinsically entangled with achieving a longer-term, stable, and equitable solution to the Syrian crisis overall. This debate is occurring in an international environment characterized by active information warfare and attempts to discredit hitherto reliable and respected information outlets in the media and in international organizations and investigation mechanisms, as well as extensive use of “alternative information outlets,” including social media.26 Thus, there is the potential for long-lasting reputational damage to international institutions and mechanisms, including independent investigative mechanisms under UN and OPCW auspices. A “normal” state-party adheres to the objectives and spirit of the treaty regime even if it is not necessarily 100 percent compliant. Many states-parties still have deficiencies, for example, in their national implementation systems. The usual OPCW approach is to encourage willingness and capacity to achieve full compliance in good faith. What is perhaps needed in the case of Syria is a process closer to that used by the International Atomic Energy Agency in handling the question of Iran’s adherence to its nuclear Nonproliferation Treaty obligations. A package of political understandings and associated measures adopted incrementally that take into account the political, legal, and institutional cross-linkages of the Syria conflict and the wider geopolitical environment may be required. The Syria dilemma is a subset of broader considerations within the decision-making levels in capitals. Political and other costs are associated with attempting to force the issue as opposed to seeking compromises or agreed exit strategies with opponents. Such compromises and strategies may be deemed desirable to achieve more positive outcomes in the medium to long term at multilateral security forums. They also may put at risk a country’s values and principles and those of the post-World War II international system, i.e., rules based, consensus driven, and acting within multilateral frameworks. Finally, political expediency has often resulted in unintended consequences. Governments, policy planners, and other concerned actors do not wish to be unpleasantly surprised or faced with geopolitical and legal problems that are even less tractable than is currently the case. High-level political and operational-level technical engagements on the chemical weapons issue remain vital as the political future of Syria and its government’s legal obligations and responsibilities obtain a de facto but likely provisional and incomplete international imprimatur as a consequence of donors beginning to provide reconstruction and humanitarian assistance and as commercial relationships eventually recover. Multilateral disarmament and arms control obligations must be implemented in an open, impartial, and professional manner, including with respect to the Syria chemical weapons problem. 1 See UN Mission to Investigate Allegations of the Use of Chemical Weapons in the Syrian Arab Republic, “Report on the Alleged Use of Chemical Weapons in the Ghouta Area of Damascus on 21 August 2013,” n.d., http://www.un.org/zh/focus/northafrica/cwinvestigation.pdf. 2 Michelle Nichols, “U.S. Hopes for UN Vote on New Syria Toxic Gas Inquiry Next Week,” Reuters, March 2, 2018. Some international investigative bodies, such as the International, Impartial and Independent Mechanism to Assist in the Investigation and Prosecution of Persons Responsible for the Most Serious Crimes Under International Law Committed in the Syrian Arab Republic Since March 2011, established by the UN General Assembly in 2016, and the Independent International Commission of Inquiry on the Syrian Arab Republic, will continue to operate. 3 Brett Edwards and Mattia Cacciatori, “The Politics of International Chemical Weapon Justice: The Case of Syria, 2011-2017,” Contemporary Security Policy, Vol. 39, No. 2 (2018): 280-297. 4 Organisation for the Prohibition of Chemical Weapons (OPCW) Executive Council, “Note by the Director-General: Progress in the Elimination of the Syrian Chemical Weapons Programme,” EC-87/DG.7, December 22, 2017, para. 6. 6 OPCW Executive Council, “Note by the Director-General: Progress in the Elimination of the Syrian Chemical Weapons Programme,” EC-87/DG.10, January 22, 2018, para. 14. 7 UN Security Council, “Letter Dated 24 August 2016 From the Secretary-General Addressed to the President of the Security Council,” S/2016/738, August 24, 2016 (containing “Third Report of Organization for the Prohibition of Chemical Weapons-United Nations Joint Investigative Mechanism”); UN Security Council, “Letter Dated 21 October 2016 From the Secretary-General Addressed to the President of the Security Council,” S/2016/888, October 21, 2016 (containing “Fourth Report of the Organization for the Prohibition of Chemical Weapons-United Nations Joint Investigative Mechanism”); UN Security Council, “Letter Dated 26 October 2017 From the Secretary-General Addressed to the President of the Security Council,” S/2017/904, October 26, 2017 (containing “Seventh Report of the Organisation for the Prohibition of Chemical Weapons-United Nations Joint Investigative Mechanism”). 8 Edmond Mulet, “How the Security Council Failed the Syria Chemical Weapons Investigators and Victims,” The New York Times, December 29, 2017. 10 John Hart and Ralf Trapp, “Same, Same?” CBRNe World, December 2017, p. 42, http://www.cbrneworld.com/_uploads/download_magazines/CBRNe_December_2017_v_Web.pdf (citing a document titled “Joint Declaration: United for a World Free of Chemical Weapons” by Belarus). 11 OPCW Conference of the States Parties, “Report of the Twenty-Second Session of the Conference of the States Parties: November 27-December 1, 2017,” C-22/5, December 1, 2017, para. 25.8. 12 Conflict Armament Research, “Weapons of the Islamic State: A Three-Year Investigation in Iraq and Syria,” December 2017, http://www.conflictarm.com/download-file/?report_id=2568&file_id=2574. On the environmental effects of the burning of elemental sulfur at the Mishraq Sulphur Plant in Iraq and reports that the Islamic State group undertook the development of chlorine and sulfur mustard at the Al-Hekma Pharmaceutical Complex in Iraq, see Wim Zwijnenburg and Foeke Postma, “Living Under a Black Sky: Conflict Pollution and Environmental Health Concerns in Iraq,” Pax, November 2017, pp. 16-18, https://reliefweb.int/sites/reliefweb.int/files/resources/pax-report-living-under-a-black-sky.pdf. 13 International Partnership Against Impunity for the Use of Chemical Weapons, “Fighting Impunity,” January 23, 2018, https://www.diplomatie.gouv.fr/IMG/pdf/international_partnership_against_impunity_for_the_use_of_chemical_weapons_declaration_of_principles2_en_cle818838-1.pdf. 14 Participants are Australia, Belgium, Canada, Czech Republic, France, Germany, Italy, Ivory Coast, Japan, Kuwait, Morocco, Netherlands, Peru, Poland, Senegal, South Korea, Spain, Sweden, Switzerland, Tunisia, Turkey, the United Kingdom, the United States, and Ukraine, as well as the European Union. Representatives of the UN Office for Disarmament Affairs and the OPCW also attended the launch. 15 Rex W. Tillerson, “Remarks on Russia’s Responsibility for the Ongoing Use of Chemical Weapons in Syria,” U.S. Department of State, January 23, 2018, https://www.state.gov/secretary/remarks/2018/01/277601.htm. 16 Russian Federation Ministry for Foreign Affairs, “Foreign Ministry Statement on U.S. Allegations Regarding Chemical Attacks in Syria,” 102-24-01-2018, January 24, 2018; “Zayavlenie MID Rossii v svyazi s neobosnovannymi obvineniyami SShA po siriiskomu <<khimicheskomu dos’e>>,” 102-24-01-2018, January 24, 2018, http://www.mid.ru/en/foreign_policy/international_safety/regprla/-/asset_publisher/YCxLFJnKuD1W/content/id/3033941?p_p_id=101_INSTANCE_YCxLFJnKuD1W&_101_INSTANCE_YCxLFJnKuD1W_languageId=ru_RU. 17 Some decisions made in multilateral disarmament and arms control forums do not meet the dictionary definition of “decision.” For example, they may rather underline concern or a commitment by governments to undertake a clarification process. 18 The latter course, however, would be a departure from the traditional OPCW approach of making decisions by consensus or delaying decision making when consensus cannot be achieved. 19 OPCW, “Report of the Scientific Advisory Board’s Workshop on Chemical Forensics,” SAB-24/WP.1, July 14, 2016. 20 OPCW, “Report of the Scientific Advisory Board at Its Twenty-Fifth Session,” SAB-25/1*, March 31, 2017. 21 Anthony Deutsch, “Exclusive: Tests Link Syrian Government Stockpile to Largest Sarin Attack—Sources,” Reuters, January 30, 2018. 22 Foreign Ministry of the Russian Federation, “Foreign Ministry Statement on U.S. Allegations Regarding Chemical Attacks in Syria,” 102-24-01-2018, January 24, 2018. 23 Dr. Sadik Toprak of Bulent Ecevit University in Turkey is currently leading a research project on open source video analysis methodologies for sarin exposure from a civilian forensic pathology perspective. 24 Article XII of the Chemical Weapons Convention allows for the conference of states-parties to restrict or suspend the rights and privileges of a state-party (until the state re-establishes full compliance), to recommend in serious noncompliance cases some collective measures against the perpetrator, and to refer the matter to the UN General Assembly and the UN Security Council. 25 The executive council, which typically prepares the draft conference decisions, meets just prior to or concurrently with the review conference. 27 Jeffrey Lewis and Bruno Tertrais, “The Thick Red Line: Implications of the 2013 Chemical-Weapons Crisis for Deterrence and Transatlantic Relations,” Survival, Vol. 59, No. 6 (December 2017-January 2018): 100. John Hart is a senior researcher and the head of the Chemical and Biological Security Project at the Stockholm International Peace Research Institute (SIPRI). Ralf Trapp, an independent consultant on chemical and biological weapons disarmament, held senior positions at the Technical Secretariat of the Organisation for the Prohibition of Chemical Weapons. The dangers of nuclear weapons are all too clear. They pose a catastrophic risk to human life and to the environment, and there is great and justified anxiety around the world about the threat of nuclear war. In East Asia, millions face this threat up close on a daily basis. I welcome the courageous initiatives taken by the Republic of Korea during the Olympic Games, but this is not enough. We need lasting improvements, based on the central objective of the denuclearization of the Korean peninsula and sustainable peace in the region. I also welcome the completion of reductions by the United States and the Russian Federation under the New Strategic Arms Reduction Treaty. Disarmament and arms control have achieved important gains. They have reduced inventories of strategic nuclear weapons, entirely prohibited chemical and biological weapons, and led to agreed prohibitions and limits on the use of indiscriminate weapons, including landmines and cluster munitions, but the first resolution of the General Assembly—seeking the complete elimination of weapons of mass destruction—remains unfulfilled. There are currently some 15,000 nuclear weapons on earth. The danger posed by these weapons inspired the Treaty on the Prohibition of Nuclear Weapons that opened for signature last year. In recent years, long-standing goals, including reductions in military spending and armed forces, have been seemingly forgotten. Military power is celebrated, without reference to the obscene human cost of conflict. The global arms trade has reached the highest level since the Cold War. Strategic tensions are jeopardizing gains in nonproliferation, as countries persist in the belief that nuclear weapons make the world safer. Nonstate actors pose an enormous threat to global disarmament efforts. Science and technology are accelerating development of autonomous and remotely controlled weapons, challenging normative frameworks. Nuclear weapons are being re-evaluated as tactical battlefield munitions—a dangerous prospect. Meanwhile, the impact of war has moved from frontlines to front doors. Armed conflicts are killing more and more civilians, as governments and nonstate armed groups use powerful explosive weapons in populated areas. Weapons of war are marketed and traded for profit like ordinary consumer goods, and taboos against the use of chemical weapons and nuclear testing have been repeatedly challenged. In the face of this deterioration, the international community must urgently rebuild a common vision on disarmament and arms control. I am preparing a new initiative aimed at giving greater impetus and direction to the global disarmament agenda. On prevention, we must respond to the dangers of the overaccumulation and proliferation of weapons and reinforce the need to integrate disarmament into the United Nations’ efforts on preventive diplomacy and peacemaking. We must work together toward forging a new momentum on eliminating nuclear weapons. On humanitarian action, we need to focus on the growing and unacceptable impact of conventional weapons on civilians and infrastructure, particularly in urban areas, which represents also a clear violation of human rights. On sustainable development, we need to strengthen the links between disarmament and the 2030 Agenda for Sustainable Development, reduce the illicit arms flows that feed conflict and divert resources, and understand the dire economic consequences of excessive military spending. Finally, we need to examine the potential risks and challenges posed by the weapons of the future. This includes the relationship between new technologies—autonomous and unmanned weapons, artificial intelligence, biotechnology and space-based systems—and international humanitarian and human rights law. We cannot contemplate further erosion of the global framework for disarmament. We must bring the current review process of the nuclear Nonproliferation Treaty to a successful outcome in 2020. This cornerstone treaty must remain strong for nonproliferation, disarmament, and the peaceful use of nuclear power. We must bring the Comprehensive Test Ban Treaty into force without delay. We must enforce the Chemical Weapons Convention and ensure accountability for violations. We must reinvigorate the agenda for disarmament and arms control, and we must work together toward our common goal: a world free of nuclear weapons. António Guterres, secretary-general of the United Nations, gave these remarks February 28 at the Conference on Disarmament in Geneva. This version has been edited for space. Putin sends mixed signals, and Trump eyes new talks. The Trump administration envisions a small number of low-yield nuclear warheads on submarine-launched ballistic missiles. The Trump administration’s Nuclear Posture Review (NPR) report calls for the near-term deployment of a small number of low-yield nuclear warheads on submarine-launched ballistic missiles (SLBMs), but the administration has yet to find the money needed to do that. The Defense Department’s budget request for fiscal year 2019, released on Feb. 12, includes $22.6 million for developing the missile variant. The department plans to spend a total of $48.5 million on the effort over the next five years, according to budget documents obtained by the Union of Concerned Scientists. But the proposed budget for the semiautonomous National Nuclear Security Administration (NNSA), which maintains nuclear warheads and their supporting infrastructure, did not include the funds needed to modify SLBM warheads. The administration plans to modify a small number of 100-kiloton W76-1 SLBM warheads to detonate at a less powerful yield by removing the weapon’s uranium secondary core. The W76 is currently undergoing a $4 billion life extension program that is slated for completion next year. NNSA Administrator Lisa Gordon-Hagerty told the Senate Armed Services Committee on March 14 that the agency is “working closely” with the Office of Management and Budget and the Pentagon to identify the necessary funding options. The Pentagon and NNSA say the modification can be completed quickly, perhaps as soon as the end of 2019. U.S. law requires that the energy secretary specifically request congressional authorization and appropriations to develop a new or modified nuclear warhead. Although the NNSA did not seek funds for the modification in its original budget request, the agency could make a supplemental request later this year or ask Congress for permission to reprogram funds from other activities. The NPR report also calls for the development of a nuclear-armed, sea-launched cruise missile (SLCM) that could be available for fielding within the next decade. The fiscal year 2019 budget request includes $1 million to begin an analysis of the performance requirements and costs to pursue that capability. The Trump administration NPR report calls for the development of the two additional low-yield nuclear capabilities primarily to counter Russia’s alleged willingness to use or threaten to use tactical nuclear weapons on a limited basis to stave off defeat in a conventional conflict or crisis, a strategy known as “escalate to de-escalate.” (See ACT, March 2018.) Russia possesses a larger and more diverse arsenal of such weapons than the United States. According to the report, the development of the two options “is not intended to enable, nor does it enable, ‘nuclear war-fighting.’” Rather, expanding U.S. tailored response options will “raise the nuclear threshold and help ensure that potential adversaries perceive no possible advantage in limited nuclear escalation, making nuclear weapons employment less likely,” according to the report. Critics maintain that the report misconstrues Russian nuclear doctrine and that additional low-yield options are unnecessary. The Trump administration is also pursuing research and development on and concepts and options for conventional ground-launched, intermediate-range missile systems in response to Russia’s alleged violation of the 1987 Intermediate-Range Nuclear Forces (INF) Treaty. (See ACT, January/February 2018.) The fiscal year 2019 budget documents do not specify how much money the Pentagon proposes to spend on this work. In total, the Defense Department is requesting $24 billion for nuclear forces, an increase of $5 billion from the fiscal year 2018 request. This includes $11 billion for nuclear force sustainment and operations; $7 billion for upgrade programs such as the Columbia-class ballistic missile submarine replacement, B-21 “Raider” heavy bomber, and the long-range standoff weapon; and $6 billion for nuclear command, control, and communications. The NPR report acknowledges that the cost to sustain and upgrade the arsenal is “substantial,” but claims the projected bill is affordable and will consume no more than 6.4 percent of the Pentagon budget. This proposed spending does not include the additional costs that must be borne by the NNSA to upgrade nuclear warheads and their supporting infrastructure. The administration requested $11 billion for the NNSA nuclear weapons account in fiscal year 2019. The Congressional Budget Office estimated last fall that the plans President Donald Trump inherited from Obama to maintain and upgrade the U.S. nuclear arsenal over the next 30 years would cost $1.2 trillion. (See ACT, December 2017.) The figure does not include the effects of inflation. The Trump administration’s fiscal year 2019 budget request includes large funding increases for theater and strategic ballistic missile defense (BMD) systems relative to the administration’s first budget submission in May 2017. Missile defense programs accounted for $12 billion of the 2019 request, including $9.9 billion for the Missile Defense Agency (MDA). Although the proposed request for the agency is up from the fiscal year 2018 request of $7.9 billion, Congress passed an omnibus appropriations bill last month that provides $11.5 billion, a increase of $3.6 billion above the original budget submission. President Donald Trump signed the bill on March 23. To thwart intercontinental ballistic missiles (ICBMs), the fiscal year 2019 request proposes $2.1 billion for expanding and modernizing the Ground-Based Midcourse Defense system. This includes construction of an additional missile field in Fort Greely, Alaska, bringing the total number of ground-based interceptors to 64. The budget request would cover 14 of the expected 20 new ground-based interceptors, as well as design and testing of the so-called Redesigned Kill Vehicle and Multi-Object Kill Vehicle intended to increase the number of kill vehicles atop each long-range intercepter. For midcourse defense against less than ICBM-range missiles, the request allocates more funding to the Aegis Afloat ship-based ballistic missile defense system. The largest line item is $6 billion for three new Arleigh Burke-class destroyers, a 50 percent increase from fiscal year 2018. Procurement for software packages and missiles decreased slightly from $2.1 billion in fiscal year 2018 to $1.7 billion in fiscal year 2019. These funds will be used to procure 43 Aegis software packages and 125 interceptor missiles, most of which are the Standard Missile-3 Block IB variant. Forty-three of the missiles are to be completed by 2020. The envisioned spending on terminal-phase defense remained about the same, including $1.1 billion each for 82 Terminal High Altitude Area Defense (THAAD) interceptors and 240 Patriot Advanced Capability Missile Segment Enhancement interceptors. The fiscal year 2019 request provides for the acquisition of enough interceptors to operate seven THAAD batteries and 15 Patriot battalions worldwide. Will talks ease tensions or set the stage for U.S. military strikes? Managing expectations for what constitutes success will be a key challenge for the United States if U.S. President Donald Trump and North Korean leader Kim Jong Un meet as anticipated next month. Although offering an opportunity to reduce the threat posed by North Korea’s nuclear weapons, a summit carries substantial risks, particularly because it would not be preceded by months of lower-level diplomatic preparation. There is little way to predict the course of any substantive discussions and the personal interaction between the two men, one a newcomer to international diplomacy who carries the mantle of U.S. power and the other a third-generation leader of an isolated, impoverished Communist nation armed with nuclear weapons. If critics of diplomacy, such as newly appointed U.S. national security adviser John Bolton, do not view a summit as making enough progress toward North Korean denuclearization, they could use the outcome as a reason to urge Trump to abandon talks and pursue a military option. Trump confirmed his willingness to participate in a summit in response to an invitation conveyed by South Korean national security adviser Chung Eui-yong, who met with Kim in Pyongyang before flying to Washington. When Chung told reporters at the White House on March 8 that Trump accepted the invitation, he said that Kim is “committed to denuclearization” and will refrain from further nuclear and missile tests. White House press secretary Sarah Huckabee Sanders confirmed on March 8 that Trump was willing to meet with Kim and that he “expects North Korea to start putting action to these words that were conveyed via the South Koreans” regarding denuclearization. She said Trump is not willing to reward North Korea just for talking. Chung and Sanders each reiterated that sanctions pressure will remain in place in the interim and that Kim understood that joint U.S.-South Korean military exercises would continue as planned. The exercises, delayed due to the 2018 Winter Olympics held in South Korea, are set to take place in April. In the past, Kim has viewed joint exercises as provocations and proof of the “U.S. hostile policy” toward his country. South Korea, however, built on the Olympic spirit that led to North and South Korea fielding a joint team and sent a high-level delegation to Pyongyang in early March. The two states are also planning a summit between their leaders for April that will include discussions over North Korea’s nuclear program and could help lay the groundwork for a Trump-Kim summit. South Korean President Moon Jae-in is planning to travel to Washington after his meeting with Kim. Managing expectations for a summit may be complicated by Bolton taking office before the meeting. Three days before he was named to succeed Lt. Gen. H.R. McMaster, Bolton in an interview with Radio Free Asia described himself as “skeptical” about North Korean intentions and warned that a summit could be a “very short meeting” if Kim is not prepared to move on denuclearization. Although the cautious McMaster allowed that a limited strike in North Korea was an option, Bolton has been a leading voice for pre-emptive military action against North Korea and Iran in order to eliminate their nuclear weapons capabilities and bring about regime change. In preparation for a summit, the Trump administration will need to consider what the United States is willing to put on the table. That could include easing current sanctions or holding off on new ones, scaling back provocative elements of U.S.-South Korean joint military exercises, and refraining from actions that North Korea views as hostile, such as flying B-1 bombers north of the demilitarized zone that separates North and South Korea. It is unlikely that Kim will agree to give up North Korea’s nuclear weapons at a summit, but he could recommit to denuclearization as a long-term goal and take steps that would decrease tensions and reduce the threat posed by the North’s nuclear program. Steps such as agreeing to continue regular talks, establish clearer lines of communication, and work toward a freeze on nuclear and missile tests and fissile material production could contribute to stability in the region. Bolton has disrupted negotiations with North Korea in the past. When serving at the State Department under President George W. Bush in 2002, he used the discovery of North Korea’s illicit uranium-enrichment program as a reason to kill the 1994 Agreed Framework between the United States and North Korea. Although the uranium enrichment violated the nuclear Nonproliferation Treaty and needed to be addressed, it was outside the scope of the Agreed Framework, which had successfully halted North Korea’s plutonium production. Trump’s threat to walk away rattles key allies. While the United States continues discussions with European partners on a supplemental agreement to the Iran nuclear deal, the European Union is starting to prepare for the impact of President Donald Trump pulling out of the accord. Brian Hook, director for policy planning at the State Department, said on March 21 he had “constructive” meetings in Berlin with France, Germany, and the United Kingdom, the so-called E3 group, on a supplemental agreement that addresses what Trump regards as “flaws” in the nuclear deal. Further, Trump in March shook up his national security team, putting into key positions two officials who have been outspoken in their rejection of the Iran deal. Trump selected CIA Director Mike Pompeo, subject to Senate confirmation, to replace fired Secretary of State Rex Tillerson, and named former UN Ambassador John Bolton, who has advocated military action against Iran and North Korea, as White House national security adviser, succeeding fired Army Lt. Gen. H.R. McMaster. The two ousted officials had clashed with the president over their views that the benefits of maintaining the nuclear agreement exceed any shortcomings. Trump’s threat has rattled key European allies, who have lobbied to keep the nuclear deal, and perhaps complicated anticipated negotiations with North Korea, which would have reason to doubt the reliability of any U.S. promises tied to denuclearization. Further, Iranian officials have said such action by Trump would mean their country is no longer bound by the nuclear deal, which could lead to a military confrontation if Iran resumes certain nuclear activities. Hook would not predict whether the United States and the E3 would conclude an agreement before the May 12 deadline, but he said conversations were focused on the sunset provisions, or elements of the deal that expire; Iran’s missile program; and stronger inspections. He said that the United States and the E3 are working to “narrow” the differences to see if an agreement can be reached. Hook’s meetings with the E3 took place as Trump fired Secretary of State Rex Tillerson, citing disagreements over the nuclear deal as one of the causes for his dismissal. Tillerson had urged Trump to remain in compliance with the nuclear deal. Although the EU did not participate in the talks between the E3 and the United States, EU foreign policy chief Federica Mogherini, speaking after the EU Foreign Affairs Council meeting March 19, said that the EU is starting to prepare to “protect European interests” in case “decisions are taken elsewhere” not to abide by the deal. Mogherini did not provide details on what the EU’s preparations included, but if the United States reimposes sanctions on Iran, it would impact European entities doing legitimate business with Iran. Mogherini, who headed the P5+1 group in negotiations with Iran on the nuclear deal, said the EU is prepared to address Iran’s ballistic missiles and activities in the region through dialogue and separately from the nuclear agreement. The E3 states are looking at sanctions to respond to Iran’s actions in these two areas, but Mogherini said the EU did not discuss any additional sanctions. The P5+1 and Iran met in March for the regular quarterly meeting of the Joint Commission, the body set up by the nuclear deal to oversee its implementation. The March 16 chair’s statement called for continued “effective implementation” of the accord by all parties and welcomed the most recent quarterly report of the International Atomic Energy Agency confirming Iran’s “continued adherence” to its nuclear commitments. During the Joint Commission meeting, Iran raised what it termed “breaches of obligations or delays” by the United States on sanctions relief. Iranian Deputy Foreign Minister Abbas Araqchi called attention to delays in licenses for passenger aircraft sales. The nuclear deal specifically references providing licenses for aircraft as part of the sanctions relief granted to Iran. Hook said on March 21 that he told Iran during the Joint Commission meeting that the United States would not issue licenses “at the expense of our national security” because Iran uses its commercial airlines to “move terrorists and weapons” around the Middle East. He said he urged Iran to make reforms to its civil aviation. Members of Congress will likely have an opportunity to seek additional clarity from the Trump administration on its approach to the May 12 deadline during Pompeo’s confirmation hearing for secretary of state. Pompeo, who served in the House of Representatives during the 2015 congressional debate over the nuclear deal, opposes the agreement. In a July 2016 opinion essay for Fox News, he called for the United States to walk away from the agreement and argued that it has virtually guaranteed that Iran will have the freedom to build an arsenal of nuclear weapons when limitations expire. Will the administration prioritize jobs or measures to prevent nuclear proliferation? As the Trump administration begins negotiating a nuclear cooperation agreement with Saudi Arabia, a growing number of lawmakers are expressing concerns that the administration is not seeking sufficiently strong nonproliferation safeguards. Energy Secretary Rick Perry led an interagency delegation to London in late February to discuss a pact, known as a 123 agreement, with a Saudi delegation led by Saudi Arabian Minister of Energy and Industry Khalid Bin Abdulaziz Al-Falih. A 123 agreement, named after the section of the 1954 Atomic Energy Act that requires it, sets the terms for sharing U.S. peaceful nuclear energy technology, equipment, and materials with other countries. The Trump administration has not commented on the status of the talks, and no agreement was announced during the visit to Washington last month by Saudi Crown Prince Mohammed Bin Salman. Saudi Arabia says that it is seeking nuclear power for peaceful purposes to diversify its energy sources. Yet, Prince Mohammed raised concerns about the kingdom’s intentions by stating in a March 15 interview with CBS News that Saudi Arabia will quickly follow suit if Iran acquires nuclear weapons. Saudi Arabia has ambitious plans for nuclear power, but currently has no nuclear power plants. The kingdom plans to construct 16 nuclear power reactors over the next 20 to 25 years at a cost of more than $80 billion, according to the World Nuclear Association. It has solicited bids for the first two reactors and hopes to sign contracts by the end of this year. can be used to make fuel for nuclear power reactors and produce nuclear explosive material. In testimony at a Senate Armed Services Committee hearing on March 22, Perry refused to say whether the United States was pushing such a prohibition. But he warned that if Washington does not sign an agreement with Riyadh, then Russia and China would be chosen instead and would demand less stringent nonproliferation and security standards than the United States. To date, Saudi Arabia has resisted a ban and suggested that it seeks to make its own fuel. Al-Falih told Reuters in a March 22 interview that “it’s not natural for us to bring enriched uranium from a foreign country to fuel our reactors.” Saudi Arabian officials say the country has natural uranium deposits to mine while critics say it is more practical and economic to import uranium enriched for civil power reactors. Opposition to an agreement that does not block Saudi fuel-making appears to be mounting. Israeli Prime Minister Benjamin Netanyahu reportedly told U.S. President Donald Trump in a March 5 meeting at the White House that the United States should insist on a Saudi commitment not to enrich and reprocess. Sen. Jack Reed (D-R.I.), the ranking member on the Senate Armed Services Committee, told Perry at the March 22 hearing that he “and many others" would oppose a nuclear deal with Saudi Arabia that does not include a fuel-making ban. Rep. Ileana Ros-Lehtinen (R-Fla.) expressed a similar view at a House Foreign Affairs Committee hearing on March 21 on the implications of nuclear cooperation with Riyadh. Ros-Lehtinen and Rep. Brad Sherman (D-Calif.) introduced legislation March 21 that would strengthen congressional oversight by requiring that lawmakers vote to approve any agreement that does not include a legally binding prohibition on enrichment and reprocessing. Under current law, most nuclear cooperation agreements can enter into force after 90 days of so-called continuous session unless Congress enacts legislation blocking the pact.